University election observation at University of Nairobi – we recognize that most young people will vote for their first time on campus. On that note; we conducted a research to understand how students vote and is there a relation to national voting? Results: After extensive research, the mission came to an agreement that SONU, the Electoral Committee, the school administration, the student population and other stakeholders have a lot of work to do in order to bring elections to globally acceptable standards. First and foremost the SONU constitution should be implemented in full. The administration should thoroughly vet the candidates as it emerged that some students with violent and improper conduct still get the opportunity to serve in SONU and the Electoral Commission. Also the issue of students overstaying in university and postponing graduation through academic breaks in order to serve in SONU is a major issue. Such individuals should be banned from participating in electoral process as they have misplaced goals and have forgotten the reason they are in the institution. Such students have ended up being drunkards and a social menace as they live on handouts from officials and practice ‘goonship’ in the institution waiting for opportunities to extort from other students and small businesses in the institution. Limiting the spending threshold of candidates vying for the various positions is also imperative. This has been the major reason why the SONU kitty is looted and plundered by officials trying to get back their investments during the electioneering period. The lavish displays by candidates has forced some to borrow and accumulate debts in order to match competitors and outdo others. Therefore it is prudent to govern candidates spending and also demand for accountability from serving officials during their term in office in order to curtail irrational spending of the SONU kitty. Cases of ‘ghost projects’ by SONU officials are believed to be the main avenue of siphoning the burgeoning kitty. Bribery of Electoral Commission officials should be curtailed through enacting strict laws and regulations that criminalize such acts and prescribe harsh outcomes if officials are caught. Civic education is also a neglected event that is vital in any election. Many students are apolitical and lack awareness of their rights in the university. By virtue of all students contributing to the SONU kitty, students have a right to demand for accountability and proper use of the funds. Such information can only be achieved if the Electoral Commission educates the electorate and lets them know of their inalienable right to vie, demand for accountability and vote for the officials. The administration should also remove its controlling hand from student politics. Due to the volatile nature of some issues in the university, the administration sees the need to impose some student leaders in order to have control over some affairs or even have a friendly leadership. This is a reason why students rebel, cause chaos and vent anger on a group of leaders. Some students believed to be pro-admin have been at times castigated and also beaten up. Therefore minimal interference is important and key to ensuring students own and control the process and therefore are confident in the leadership at the helm. Held university engagements named ‘Siasa Talks’ these are on campus events with students where SP educates on the different articles of our constitution to youth and how they can participate more. Community dialogues, these grassroots engagements with a focus still on the constitution. In 2016 we also hosted the World Trade Organization Youth discourse. This discussion was focused on understanding what WTO means to young people. Held on December 10th at Strathmore University. How it came about: The 10th WTO Ministerial Conference was being held in Kenya. We decided to have a policy meza, that is a policy roundtable discussion on what the youth think should be covered by our Ministry at the WTO. We invited representatives from diverse youth organizations representing youth groups in different sectors from Business, Climate, and also Academia. After the Policy Meza it was clear that the youth were not very knowledgeable on WTO matters and we collectively decided to create a reference group and organize a discourse. Siasa na Raia – held on Friday January 29th we have managed to invite 10 political parties. A platform for discourse that was aimed at creating public awareness on the various stakeholders in the political process within the country and ignite interactions between political parties and the citizenry on their mandates and what platforms are available for engagement. The uniqueness of the event was the transparency, being able to invite different imperative stakeholders to openly share information, discourse and engage with citizens was an occurrence that rarely happened in such a platform before. The purpose of the Siasa Open Day was to create an enabling platform for information sharing. 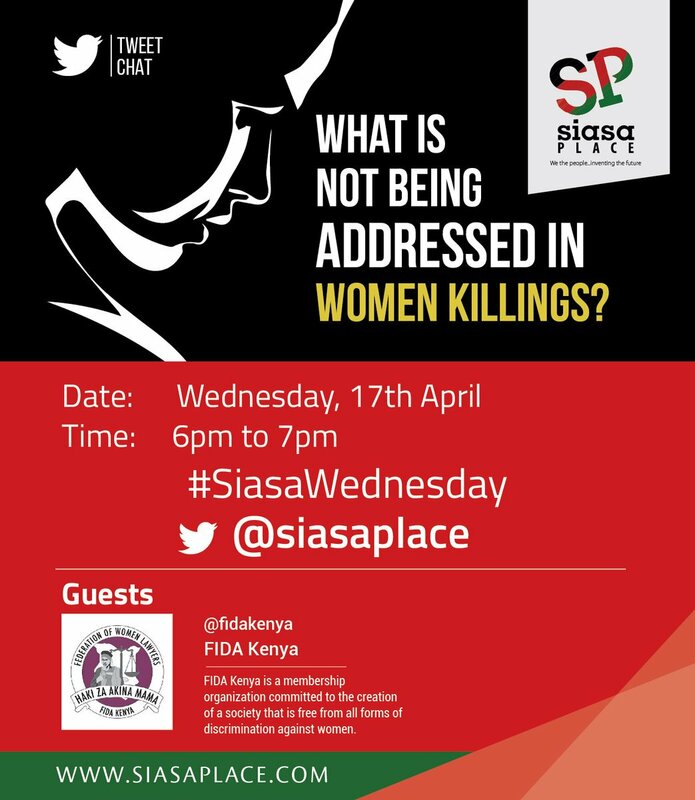 #SiasaWednesday: Every week on Wednesday we discuss current national issues. This year we held 52 online chats. Vigorous in discussing current national issues online every week and relied on factual information as well as the constitution for basis. We were focused on creating a space that was objective, youthful, and inclusive as well as involving experts who could engage on electoral processes. Host 40 online weekly chats on twitter under, #Siasa Wednesday and have seen the engagement grow by 105% increase of followers on Twitter from 2900 to 5945 and 217% increase on Facebook followers from 633 to 2008. Twitter analytics for the last couple months (from October 2017-january 2018) show various impressions, reach and growth with highest impression meaning people who engaged online up to 134.9k. Focused on youth at the grass root level, engage more youth offline through engagements in the community and in high schools and universities. Our target audience is age 15 years to 34 years of age. Held 10 community dialogues educating youth on public participation processes and distributing copies of the constitution. a partnership in an effort to address the challenges. Formed a more structured youth coalition to push for their issues in Kericho County. Currently working on building the coalition through partnership with the county government and organizing youth groups. Also started the process of the Youth Inclusion Policy formulation. come up with a sexual reproductive health policy that targets the youth. Currently working on capacity building Bright Future Foundation as a registered organization and formed an official partnership with the County Government of Samburu to be the youth representatives of the county and establishing an office in the Assembly. Additionally contribute to the formulation of the youth inclusion policy. Despite some youth showing commitment, the county government failed systems have contributed to discouragement of the youth. The objective of the meetings was to train youth on the need to actively participate in public participation in regards to the CIDP and the budget process; and how to be organized in demanding for accountability from the county government in terms of service delivery. During the meeting, the youth were trained on the budget cycle and the entry points as to when to get involved in the process of budget Making. They were also trained on how to draft petitions and memoranda, and use them as tools of engagement with the county government. Additionally strengthening the capacity of youth MCA caucus additionally contribute to the current formulation of the internship policy. Organized 20 youth groups to come together to attend an actual reading of the Public Participation Bill 2018 and submit their concerns as well. The reading was held at County Hall in Nairobi on May 9th. Recommendations made to the bill were as follows: Specific places where information is put up – such as utilizing chiefs, Village and Ward Administrators Office as well as MCA offices, MP offices, CDF offices as well as sending to civil society organizations, inclusion of social media and to better define information communication technology centers. 4. (1) the relevant institution shall give the public adequate notice to make their input on the issue. Minimums need specifying: 1 month 5. (1) The responsible authority shall ensure that stakeholders have fair and equal access to the public participation process and the opportunity to influence the intended decision. What are the sanctions if they do not do this? Can a decision be put on hold? Can a project be stopped if it is deemed that all stakeholders did not have fair and equal access to public participation? 7. The responsible authority shall establish and ensure maintenance of an online platform to enable access, through the internet, of information relating to the institution and any other notices to the public. Most county websites are poor and not updated and seem to aim to keep people uninformed. This needs clear guidelines and enforcement. 10. 3(b) may, where the authority incurs expense in providing the information, be subject to payment of a reasonable fee; Information provision must not be denied for fiduciary reasons – information is a right. If it is relevant to the purpose for public participation it should be provided for free to the public. We took part in the collection of youth views on how they were involved in the 2017 General Elections. This was done in Muranga and Kisumu counties targeting youth from different backgrounds. Final report collected into a publication and shared by The Carter Center. #WomenAtWebKE was number one trending in the country with a total of 11,820,646 impressions which was a clear indication that women being on the web was of vital importance. The online engagement was tremendous as diverse voices joined the conversation and followed the on goings of the training as it ensued. #AbortionDebateKE was number one trending in the country with a total of 11,950,653 impressions showing how women and men are curious to voice their opinion on sexual reproductive health matters. An important impact is the removal of Eritrea government’s use of the sanctions as justification for repression of citizens including indefinite national service. The changes we need to see relate to our approach to the government. There is a need to put pressure on them to change. The first steps to change should be to dismantle the structures that enable and sustain indefinite national service, restore constitutional safeguards on rule of law and human rights, including the ability of all Eritreans to choose their leaders in free and fair elections. Additionally, is if power is in the hands of the people, not one man and most importantly the establishment of constitutional democracy. Without it, the Eritrean people will never be guaranteed justice and equality. With it, they will have the chance to decide the future of their own lives and for the nation they fought for and love. Conflict due to oppression by the Government. Youth movements like #LuchaLibre have played key roles in youth activism in Congo. As Congo yearns for positive change in political leadership, there is a need to prioritize and put humanity first and commitment for service delivery. DRC needs leaders who focus on humanity and the protection of their citizens. The electoral commission needs to come up with strategies that will ensure full participation of the voters. Young people also vote during party primaries, but most times do not fall into the delegates’ categories when it comes to indirect primaries. This, in turn makes it difficult for them to have a say in the emergence of candidates. To solve this, the #NotTooYoungToRun movement that is now @ReadyToRunNG has embarked on a ferocious campaign to demand youth candidacy, and open party primaries from all political parties. This will ensure inclusion in our democracy. We held community dialogues for Youth (trainings on the County government structures *our session was called ‘Jua County Yako* and public participation) with JIACTIVATE, a consortium of Youth groups across the country working on different issues. The 15 counties were Machakos, Makueni, Kajiado, Nyeri, Muranga, Kisumu, Siaya, Busia, Kilifi, Mombasa, Isiolo, Nakuru, Bomet, Uasin Gishu and Turkana. In these forums we reached 100 Youth per county, that’s 1500 Youth between February and May. From these forums the State of the Youth Report was written and launched in June, 2018. We also took part in Twitter discussions hosted by Jiactivate on different topical issues around the Country. Also part of the JIACTIVATE Steering Committee that spearheads the running of activities in Jiactivate.